For UK orders please enclose an A5 stamped addressed envelope and payment (if more than 3 books use an A4 envelope). Unless otherwise specified all books relate to the period 1580-1660. If the postage exceeds a second class stamp in value per book we will pay the excess. Entries such as 32p refer to the number of pages in a publication not the cost of postage. Overseas orders: In Australia or the US please see Overseas Distributors. For trade orders or other areas: Payments must be made in GB Pounds and postage will be charged at cost [no packing charge, just the stamps]. 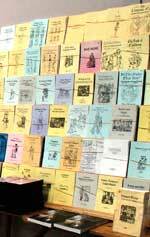 HMA Ltd also stocks selected works by other specialist publishers especially those written by the company’s staff. For greater convenience those works by other publishers which we stock are now listed with our works but clearly labelled at the end of the entry. Price changes on these works are beyond our control.